Over these past few months, Computrols’ experts have presented at multiple industry conferences around the country. 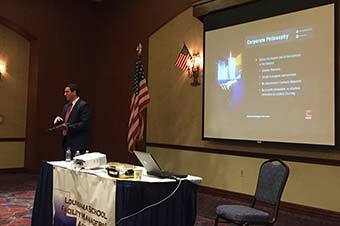 Computrols Vice President of Operations, Drew Mire, presented to the Louisiana School Facility Managers Association (LSFMA) at the their fall conference on October 20th. The LSFMA is made up of facility managers from K-12 schools throughout the state of Louisiana. The aim of the organization is to give their members an opportunity to network with like-minded professionals and learn about what they can do to better their campuses. The LSFMA fall conference was held at the Paragon casino in Marksville, LA, where 40+ members gathered for educational sessions and networking. In the final session of the day, Mire spoke about trends we are seeing in technology and how they are affecting the operations of K-12 schools. In doing so, he covered everything from LED lighting to the latest advancements in school security systems. 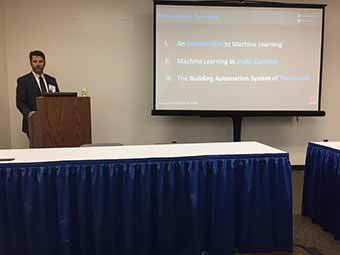 Just a few weeks later, Computrols Director of R&D, Mike Donlon, presented at the 11th annual Mid-Atlantic Building & Facility Management Show & Conference (MABFM). This event featured over 200 exhibitors and nearly 400 attendees at the Garden State Exhibit Center in Somerset, NJ. The topic of Donlon’s presentation was machine learning in HVAC controls. He first took his audience of facility engineers through an introduction to machine learning, giving a number of examples of where we see machine learning in our daily lives. He then went on to explain how machine learning is being applied in the latest technology in HVAC controls. Donlon closed with his vision of where the building automation industry is going technologically, highlighting some of the R&D projects Computrols has in the works. The Computrols marketing team also exhibited at the MABFM tradeshow, where it showcased the simplicity of Computrols Building Automation Software. Their demonstration included the use of an LX controller which is due to launch in early 2017.